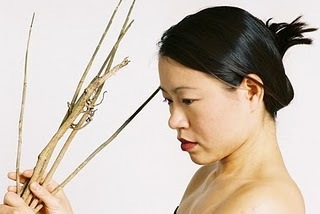 Aiyun Huang was winner of the First Prize as well as the Audience Award at the 2002 Geneva International Music Competition; the first prize in percussion has been awarded only three times in the competitionís history. She has appeared at the Weill Recital Hall, Los Angeles Philharmonic Orchestraís Green Umbrella Series, LACMA Concert Series, Holland Festival, Victoria Hall in Geneva, Agora Festival in Paris, Banff Arts Festival, 7Ème Biennale díArt Contemporaine de Lyon, Vancouver New Music Festival, CBC Radio, La Jolla Summerfest, Musik 3, Scotia Festival, Centro Nacional Di Las Artes in Mexico City, and National Concert Hall and Theater in Taipei. In 2004, she gave a solo European tour in the cities of Paris, Geneva, Lyon, Budapest, and Milano. In both 2007 and 2008, she was a featured percussionist at the international Cool Drummings festival in Toronto. She has performed as a soloist with National Symphony Orchestra of Taiwan, La Jolla Symphony and Brott Academy Orchestra. Between 1997 and 2006, she was a member of red fish blue fish under the direction of Steven Schick. She is founding member of Canadian trio Toca Loca with pianists Gregory Oh and Simon Docking. She has commissioned and championed over 100 works in the last decade working with composers from the United States, Canada, Europe and Asia. Besides working with composers and performing new music, she is a researcher at CIRMMT. Her current research include a three-year DVD recording program titled "Save Percussion Theatre: Documentation from Performer's Perspective" funded through FQRSC as well as "Expanded Musical Practice Interdisciplinary Approaches to Live Electronics in Composition, Performance and Technology" through SSCHRC. Aiyun was born in Kaohsiung, a city in the southern part of Taiwan. She left Taiwan when she was seventeen to pursue her love for music. Aiyun holds DMA degree from the University of California, San Diego. Between 2004 and 2006, she was a Faculty Fellow at UCSD. Currently, she is the Chair of the Percussion Area as well as director of the McGill Percussion Ensemble at the Schulich School of Music of McGill University in Montreal, Canada.